An extra special something blue. You feel that the intensity of your love is rare; why not choose a rare blue diamond engagement ring to express the sentiment? Most rings that incorporate blue diamonds are exquisite by nature-even if they're not made by nature. Still a diamond, but with a twist, blue diamond rings are just what the doctor ordered for non-traditional couples with an old-fashioned flair. Still, there are pros and cons to consider about blue diamonds before making a purchase. They stand out in a crowd. If you're looking for a status symbol, a colored diamond will get you there. A traditional bride may wish for "something blue." Her engagement ring can be just that. There are unisex bands that could fit the needs of the bride and groom. Blue diamonds are generally found set in white gold. 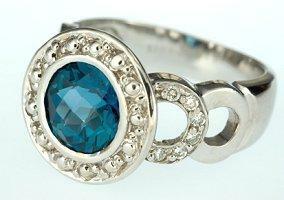 All sorts of engagement ring designs are available featuring blue diamonds. They're quite expensive compared to their clear, or white, counterparts. These diamonds are usually on the small side if they're within the average person's price range. Some people may view manmade diamonds as inferior to the real thing, and genuine blue diamonds are extremely rare and incredibly expensive. Shopping for one will be more challenging than looking for more traditional engagement rings. The darker, the better. If you're opting for a genuine blue diamond as opposed to one that's experienced man's helping hand (think irradiation and intense heat rather than hundreds of years in nature), prepare to pay a premium. Most blue diamonds sold today are manmade. In fact, if you find a jeweler who claims to have a natural blue diamond, you should be very suspicious. Definitely do extensive research before purchasing that particular ring. Material girls aren't the only ones who will love blue diamond rings, but they did gain their popularity in the 1980s. Despite the conservative nature of fashion in the 1990's, the desire for blue diamonds grew into that decade and is still going strong today. Not everyone has a colored diamond, and most people like to have a little something special, especially when it comes to something as significant as an engagement ring. If you like the color but not the price of blue diamonds, consider another blue stone such as aquamarine or sapphire. No matter which shade - light or dark - you prefer, you should be able to find the color you long for in your bridal jewelry. You could even combine the two into a three stone engagement ring. Set in white gold, a ring with various colors of blue stones will be delightful. Whether you go for a blue diamond engagement ring or choose to skip it due to the price, you can still choose a wedding band that features blue diamonds. The diamonds are generally smaller on the bands than those used as the center stones on engagement rings. A wedding band may be a better alternative for someone who loves blue diamonds but can't afford large blue diamonds. If you've decided to look at blue diamond rings, you'll need to know where to find them. Blue diamonds aren't sold everywhere, so if you want to go look around in person, you may be best served by calling ahead first. Diamond for unique shapes as well as colored diamonds. Most blue diamonds are set in white gold or platinum, but if you prefer another metal, you can always have a ring custom made. If you don't limit yourself to collections labeled "engagement" you will find more styles and possibly even better prices. To find a reputable jeweler who deals with blue diamonds, check with the Better Business Bureau and look for those who are members of the American Gem Society. Blue diamonds are a stunning alternative to more traditional rings, and a blue diamond engagement ring can be just as unique and precious as the relationship it symbolizes.